According to Net Applications recent stats show Firefox market share at 20% for two weeks in October, for full month it is hovering at 19.97%. This is the first time Firefox hit 20% market share. IE still carries the largest market share at 71.27%, Safari is at 6.57%, Opera is at 0.75% and Chrome is just at 0.74% for the month of October. These stats represent the Firefox global usage including all kinds of websites. 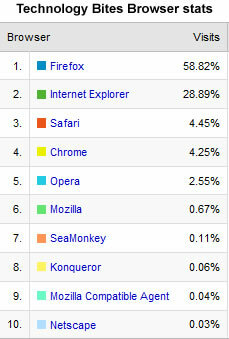 If you look at tech focused sites stats you will see Firefox market share above 50%. For example my own stats show that Firefox share is at ~58%. Wow, after the release of Google Chrome, I didn’t see this coming. I Really wasn’t expecting it.